Trainer Graham Motion shipped stakes winner, Happy Mesa to compete in the Surfer Girl Stakes at Santa Anita Park on October 10th. The 2 year old filly, by Sky Mesa was fresh off two consecutive wins at Laurel Park. 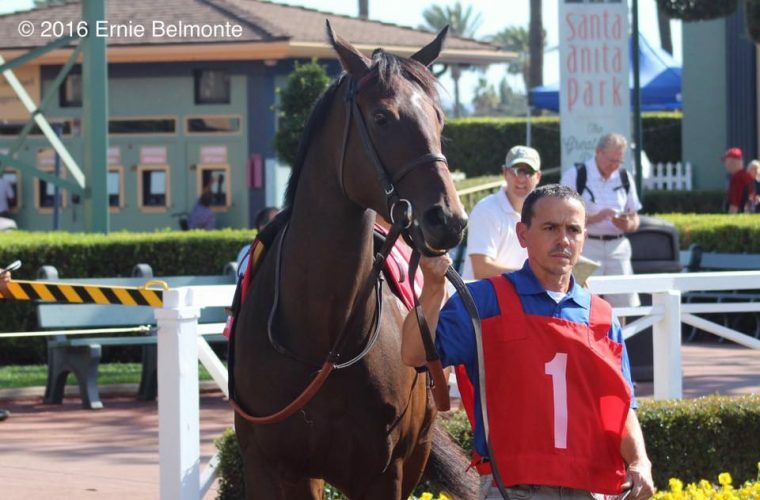 She was purchased privately by BSW Bloodstock after her win in the Selima Stakes and first off the purchase ran a great second in the Surfer Girl Stakes. The field of 11 fillies broke well from the gate for the start of the 1 mile test over the grass. Jockey Florent Geroux, who flew in for the mount, saved ground behind horses then came out for room and split horses in the stretch. Happy Mesa passed between rivals under urging and continued to gain on the rail despite the rider losing the whip at the sixteenth pole. With her strong performance, Happy Mesa will be pointed towards the Breeders Cup Juvenile Fillies Turf Grade 1 at Santa Anita on November 4th. Congratulations to Great Point Stables, LLC, Highclere America LLC, and Zoom and Fish Stables Inc.